A sputtering start for both teams culminated in a win for Kellyville at 28 to 12 on Friday night. It was a victory that mirrored last year to a large degree. 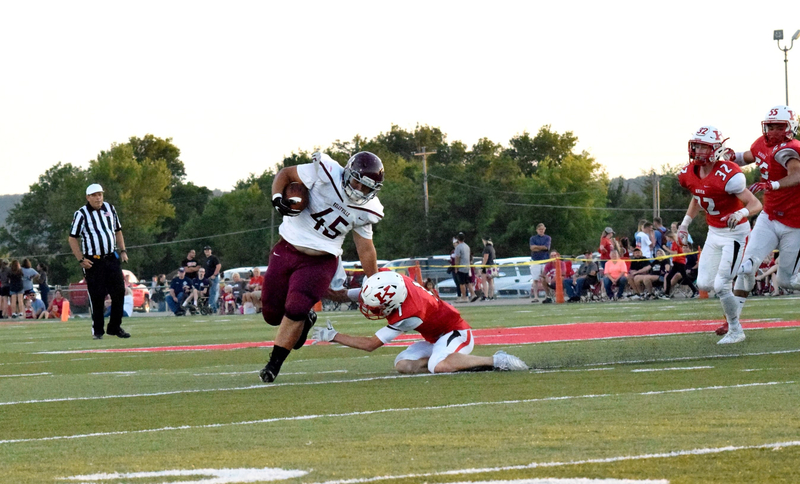 Last time Kellyville played Kiefer, they were able to chalk one up in the win column, and it was the start of what would go on to become Kellyville’s best season in over a decade. And with most of the popular names on the Ponies returning this year, we were expecting a similar showdown. From the press box at Kiefer Trojans stadium, it was difficult to tell who had the bigger crowd, the home or visiting team. Each one was loud and cheering when their team was performing well, and there were several good moments for each side. Kellyville received and for at least the first two turnovers, the game didn’t move past the 50 yard line, even after Kellyville sent a slicing punt into the standing teammates at the sidelines. And immediately after I said as much on Twitter, Kellyville opened up past the line and hustled down the field, clearing the 50, then the 40 and nearly the 30 before someone from behind knocked the ball loose and it was recovered by Kiefer. Still, the turnabout wouldn’t help, as the first quarter ended with a score of a lot of nothing. And then it’s like a switch was flipped the Ponies came firing out of the chute the start of the second quarter, first with a nice carry by Dylan Pickering, and then a long bomb to Hayden Hutchins brings them within a couple of yards of the end zone, before crossing over, and Ponies draw first blood. They go for 2 but it’s no good. Now 6-0 Ponies. In the first half of the game, Kiefer had a tough time catching ball, whether it was punts, kickoffs or passes. It cost them some considerable time and yardage, in some places where they really could’ve used it. They finally managed to start connected by about the end of the 3rd quarter, but it was too little too late for the Trojans, as they’d never get enough yards to come back from their early mistakes, despite a late-game TD to take the score 28 – 12. For Kiefer, we have #12 QB Tanner Folsom, who’s name kept coming up, whether it was in passing or trying to hustle the ball down the field when he couldn’t find an open receiver. Folsom was largely responsible for all the gains that Kiefer had last night. Running Back Hayden Hutchins (#3), who was last year’s standout player, and listed by Tulsa World as this year’s “Player to Watch”, showed more of the same in this game. Pickering misses the snap but catches it on the bounce, runs for 14 yards. 1st and 10 at the 11 yard line. But Friday’s MVP has to be #45 William Peterson, who turned out to be something of a secret weapon: if the 6ft, 250lbs fullback found is way through the line, there was no stopping him. He made a couple of fantastical plays, including the one that we’re using as our featured image for this story. 58 YARD TD RECEPTION from No 12 Colton Ayres to No 24 and Kellyville is now 27. Kellyville goes to Morris for their next game in 2 weeks on September 14th. Kiefer plays their first away game at Rejoice Christian next Friday.